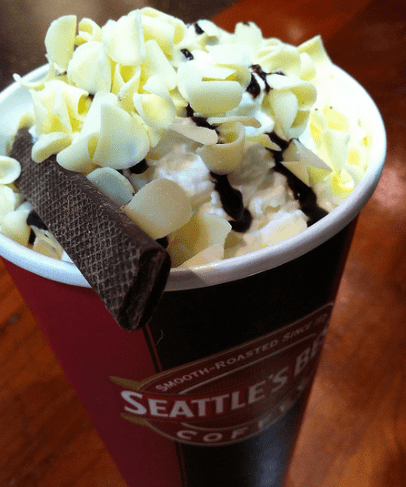 Home/Featured/Mitt Romney Stiffs Baristas, Offers Them His Half Drunk Hot Chocolate Instead. Posted today on PatriotBoy Blog comes this story of a friends brother who works as a barista at a Seattle’s Best in a Borders Bookstore in the upscale area known as The Riverwoods, at the mouth of Provo Canyon in Utah and an interesting visit by Mittens that left a bad taste in his mouth. One day in 2010 the baristas were surprised to see Mitt Romney and his wife come to the counter. Since they’re both Mormon, neither ordered a coffee drink. They each ordered a hot chocolate and took them… without tipping. It seemed odd for someone so wealthy not to tip, but no one thought of it as a big deal. Baristas usually make less than minimum wage and make their living on tips. I understand that it’s not worth Bill Gates’ time to pick up a hundred dollar bill, but Mr. Millionaire couldn’t dump his change in the tip jar? …only they didn’t know just how out of touch he was until later. Romney spent some time in the coffee shop as his wife browsed through books before they were called to leave. Creepy and an Ewwwwww Factor off the charts! And you know what. I believe it.